How about this: Aethon can only talk to whoever wears the crystal? That way, you can keep your character, and the magic doesn't go too out of control. I'm going to delete all the posts pertaining to Ekez and Aethon, except at the start where Aethon is talking directly to Rendak. As is established, Aethon can talk to Rendak. I'm finished deleting the concerned posts. I'm going to assume that you're talking about what Morrigan said. I don't know. I just assumed that if he had magic, then it would be relatively strong. Until you tell me more about Ekez, and make him a character sheet, he doesn't exist. uh hey, you may have noticed that i am somewhat... inactive. well, im taking a little break until i get the feeling to post in this forum again. so lets just say that for the time being, Jack is in the hospital and Nika is on vacation with her parents. sorry everyone. hopefully i will be back, and if not... then we'll see what happens. I look forward to when you come back Jack. I'm sorry you got the feeling, but it happens to the best of us. I hope you have fun until you come back! We'll all miss you while you're gone, Jack. I really do hope that you come back soon. Bye Jacky, come back sooooon! ...on that note, has any RP used it here? I know somebody used it in RG on about page 10, but I've not seen it at all in recent times. I think that catnip has been very under the radar in Pet Friendly. And Liz hasn't used it in the roleplay itself. She has during timeskips though. And she still does catnip. She's afraid that others will find out that she still does it. You think WONDER'S the only one who'll be alone? Vanilla never has, nor has Honey. sorry, but my timezone is a little off yours, hehe. I'll still post whenever possible! I can't speak for Liz, but let's leave it that Honey didn't hear him. I'm magical, I guess, and my mod senses screamed "somewhere there is borderline questionable stuff going on, check it out!" Or I had a feeling to check out the roleplaying forum, which I actually used to read till a few months ago. But enough about me! Back on topic. I know Zack will be too. But maybe, just maybe, they can bond over their equal feelings of missing Jack and become friends...ish. Do I just go ahead and start up? If not, sorry I forgot to check this place out before I made a post in the actual IC portion of this thread. o .o oh well, I can delete my post and put together the character sheet and wait. I don't mind. Well, thanks for the welcome. However, is there some kind of basis I need to follow for listing my character? Or do I just put what I think you need to know? Would ya like me to PM you an example? Umm, I think I got a little carried away on the personality part... sorry. But, anyways. Let me know if I need to change something, especially in the stats alright? I don't want to start until I know I'm not going to do something I can't. 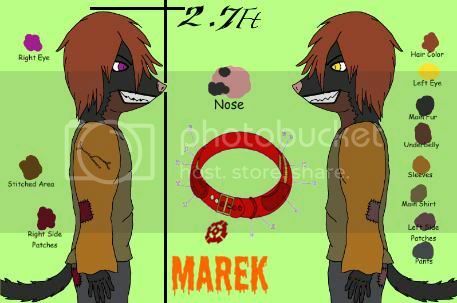 Personality: Mareks can get anxious if he's not near a source of fresh air. He's happy in general, not letting things upset him or rain on his parade so to speak. He's not one to rush with introductions, liking to not be the first one to talk when meeting a new face. He's not shy, and if he likes something, he'll announce it. If he finds something on the ground, he'll claim it as his if he thinks he can use it as something, which could seem greedy or strange to some people, especially if it was something someone lost and he refuses to return it. He's not below just searching an area or different home for food if he's hungry, eating our of boredom, and this gets him in trouble sometimes. He'll try to avoid anything getting on his nerves, or avoid something he doesn't enjoy entirely, but if he can't, he could easily frighten someone when their not expecting anger. Once angered, the target of his venting, depending on their size and just what it was that got him mad, could end up with just some cruel words, to an outright open wound from his many sharp teeth. Once calmed down, his guilt is quick to set in, unless he believes that the person truly deserved what they received. He loves to play fight, especially if that fight is a war type scenario. In a sense, he can sometimes act like a stereotypical 'Weasel', meaning "I'll do it my way and not care about your opinion" type of thing. He has many interests, ranging from philosophical, to just flat out awkward topics as well. Other: His hair is a result of his fathers work; his fathers a scientist working on a cure for baldness with the use of all natural products. These are of course tested on Mareks, who doesn't mind... when it doesn't burn from an allergic reaction. He has a slight capacity for seeing the dead. For the most part, they only appear as a wisp of fog when he notices them, like small whispers that he cant's make out. He only ever has one eye showing at any given point, only showing both by accident. He's very nimble, and can slip quickly through holes a little smaller then himself. His speed helps him maintain a good balance with his lack of strength in a game involving physical contact. Str- 3 "Hang on, I'll go get dad to lift this!" Per- 5 "Hmm... fog is strange, it's only in certain areas, and looks like it's walking." End-5 "Can we slow down a bit? I'm fast, but only in short distances!" Chr- 7 "Hey, I just finished counting, and I've got 300 friends!" Int- 7 "Alright, I need you three over here, and you two watch our backs. This plan is sure to work!" Agi- 10 "Run, run, run, as much as you can, you'll never catch me, I'm too swift while on land!" Luk- 5 "Wow, good thing I ducked just there. It only skimmed me." Last edited by Mareks on Fri Dec 10, 2010 4:44 pm, edited 2 times in total. I approve of your character. You're free to post now. Welcome to Radiant Gardens. One thing that I noticed, is that your stats are 2 less than the max of 42. You don't have to change it if you don't want to, but I just wanted to let you know. Okay, so is the slumber party going to end when this game ends? I ask because I'm starting to want to get into the Christmas arc soon, but I don't want to end this one prematurely.